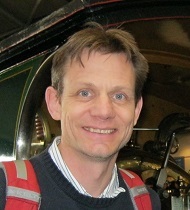 Robin Cleveland is Professor of Engineering Science at the University of Oxford. He received the BSc and MSc degrees in Physics from the University of Auckland, New Zealand and the PhD degree in Mechanical Engineering from the University of Texas at Austin where his doctoral research was on sonic boom propagation in the atmosphere. At the completion of his PhD he was award the F.V. Hunt Fellowship of the Acoustical Society of America which he carried out at the University of Washington in Seattle studying shock wave lithotripsy – breaking of kidney stones by shock waves. After two years in Seattle he joined the faculty at Boston University where he remained for fourteen years rising to the rank of Professor of Mechanical Engineering where he continued research in the general area of acoustics with a focus on biomedical applications. In 2011 he joined the Institute of Biomedical Engineering in the Department of Engineering Science at Oxford. He carries out research in nonlinear acoustics with particular application to biomedical ultrasound. For OxCD3 his main focus is using shock waves to help deliver antibody fragments, and potentially other therapeutic agents, into cells with the goal of disrupting cancer. This involves understanding the interaction of shock waves with cells structures in order to open cell membranes. Other areas of research in cancer treatment include: high intensity focused ultrasound surgery for thermal ablation, use of ultrasound to monitor ultrasound therapy, and the development of shelled microbubble for ultrasound theranostics (targeted imaging and drug-delivery). Related topics include improving the use of shock wave lithotripsy and the role of sound and vibration in traumatic brain injury. He is a Fellow of the Acoustical Society of America and was an associate editor of its journal for 8 years. He was appointed to the board of the International Society of Therapeutic Ultrasound in 2013, was a Plenary Speaker at the International Symposium on Nonlinear Acoustics, Lyon, France (2015) and was the Royal College of Surgeons of Edinburgh, Guest Lecturer at World Congress of Endourology, London (2015).